What is a Tech Home? I think of a Tech Home being a home that is up to date on the latest technology available. It could be things like appliances, smart outlets, or as simple as our phones and computers. I love browsing through all the newest gadgets and adding them all to my wish list to have one day. If you are like me, you will love checking out the Best Buy Tech Home being built at the Mall of America in Minneapolis, MN. 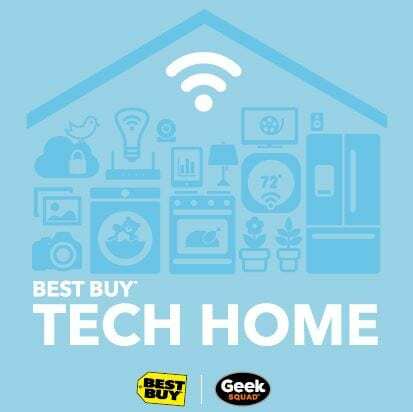 Best Buy is bringing to life a Tech Home that you can view, touch and try the latest tech gadgets for your home. You are able to have the opportunity to learn about the latest in CE and Connected Home by touring the Tech Home with an expert Blue Shirt or Geek Squad Agent. Feel free to asks these guys any questions you may have regarding your Tech Questions. Some of the products you are expected to see at the Tech Home come from Samsung, Canon, NETGEAR, Philips Hue, Sony, Sonos, and Savant. They have the latest and greatest products to view in this home. I want to go up to Minneapolis and check it out! Doesn’t it sound awesome? GUESS WHAT?! There are 2 current sweepstakes going on. Come and visit Tech Home at the Mall of America to learn how you could win a $10,000 Best Buy Gift Card, a Samsung SmartThings Smart Home Collection, Samsung Dream Kitchen, and a Samsung 55” SUHD 4K TV and more. Be one of the first 250 to visit the Tech Home at the Mall of America each day from 8/22-9/17 and you could win one of many prizes made with Qualcomm technologies including Sonos Play:1 speakers, Samsung Gear S2, and more. Abbreviated Rules: No purchase necessary. See www.BestBuy.com/TechHome for full rules.